At the University of Florida College of Dentistry, every student, faculty and staff member comes to work with a charge of contributing to the college’s three-part mission – education, research, and patient care. Tangible results oftentimes measure success: an A+ on an exam, published research, a stellar performance evaluation, and numerous patients seen each day in the college’s student, resident and faculty practice clinics as the college strives to make an impact on oral health in the state of Florida and beyond. But often, personal success stories have a way of making UFCD faculty and students, alike, take a step back from the day-to-day, and realize the true impact they have on patients’ lives when caring for the many adults and children that enter through the college’s clinic doors. 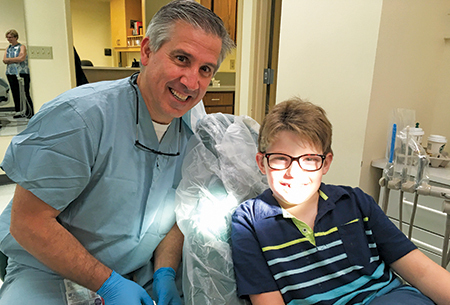 It was an ordinary fall morning at the UF Academic Health Center for Calogero Dolce, D.D.S., Ph.D., chair of the Department of Orthodontics, who practices in UF Health’s Faculty and Resident Orthodontic Clinics. Dolce took a quick trip down to the health science center Starbucks for a daily dose of caffeine, but he got more than expected from the crowd favorite: boisterous, happy and energetic Starbucks manager, Bob Pisco, who runs a well-oiled machine fulfilling endless drink and food orders at the always-bustling location. “I think you’re treating my son,” Pisco said in passing as he jotted Dolce’s coffee order on a cup. It didn’t take but a minute of conversation for Dolce to identify Pisco’s, Nathan, as a frequent patient of the college. It was through that conversation, and those with Bob’s wife, Nathan’s mom Melissa, that Dolce realized the life-changing impact the College of Dentistry and the interdisciplinary team of health care providers at UF Health has had on Nathan and the Pisco family. At the College of Dentistry, the belief is oral health is the gateway to overall health. The expression couldn’t be more true for nine-year-old Nathan. It took Bob, a Navy veteran, and Melissa, senior pastor at Celebration United Methodist Church in Gainesville, nearly seven years of struggling through various behavioral issues at school and sleepless nights at home for Nathan to finally get the help he needed. Nathan’s pediatrician recommended him for a sleep study at age seven in 2016. From there it was a domino effect, and a complete whirlwind of doctor appointments for the Pisco family. Autism, seizures, sleep apnea, Attention Deficit Hyperactivity Disorder, or ADHD, microcephaly, lissencephaly and a chromosome duplication – several of the battles Nathan was fighting. In Nathan’s case, it was a true team effort and cross-collaboration at UF Health that led Nathan to the College of Dentistry. Following Nathan’s sleep study, pediatric neurologist Paul Carney, M.D., conducted an electroencephalogram, or EEG, and a magnetic resonance imaging, or MRI. Nathan registered an irregular EEG, and his MRI revealed an underdeveloped brain, small skull and narrow airway; he was diagnosed with central and obstructive sleep apnea. The interdisciplinary team was assembled and a rapid-fire treatment plan devised. Cynthia Johnson, Ph.D., pediatric clinical psychologist, Richard D’Alli, M.D., pediatric psychiatrist, William Collins, M.D., FACS, FAAP, a pediatric otolaryngologist, Henry Rohrs, M.D., pediatric endocrinologist, Daniel Driscoll, M.D., a pediatric geneticist, Regino Gonzalez, M.D., pediatric gastroenterologist, and in the College of Dentistry: Abi Adewumi, B.D.S., FDSR, in pediatric dentistry and Dolce in orthodontics. Collins removed his adenoids and shaved his tonsils to help open the airway. Then, following a two-month recovery, enter dentistry. Adewumi gave Nathan his first deep cleaning, extracted teeth and put on several crowns. Next, Dolce got to work expanding Nathan’s upper jaw, which took a month. It was certainly a process well worth the wait. Today, Nathan attends the Einstein School, and pals around with his service dog, Blitzen. He loves Disney, and loves to keep a regimented schedule. He’s delayed, Melissa said, but with ongoing therapy and treatment he’s in a mainstream classroom, receives exceptional student education, or ESE, services, he’s made friends and is much improved. Nathan is still followed by Adewumi and pediatric dentistry, and braces with Dolce are in his future, but for now, a huge weight has been lifted.